Editors: Gratton, Peter and Ennis, Paul J. This is the first dictionary to define the work of this stellar new philosopher. Quentin Meillassoux - described as the fastest-rising French philosopher since Derrida - is one of the most exciting philosophers writing today. 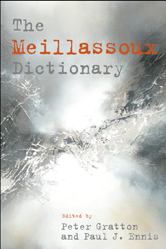 Perfect for philosophers just starting with Meillassoux, this dictionary defines all of the major terms of his work, prefaced by an introduction that argues for the importance of this new figure on the Continental philosophy scene.